Clothing/Jewelry Description A brown or tan mid-length coat, brown pants, shoes and possibly a plain gold wedding band on her left ring finger. Possibly carrying a small maroon plastic carry-on bag of toiletries. Medical Conditions Wilcox suffers from heart disease, Alzheimer's Disease and depression. She is supposed to be taking prescription medications which she does not have with her. Distinguishing Characteristics Caucasian female. Gray hair, blue eyes. Wilcox has a mole on the back of her neck. She wears a full set of dentures and eyeglasses with gold wire frames. Wilcox was last seen at her residence in the 100 block of Cambridge Road in Westford, Vermont at approximately 10:00 a.m. on November 9, 2006. She was upset at the time. Wilcox was discovered missing at 3:00 p.m. She did not not have a driver's license at the time of her disappearance, but she does know how to drive. She didn't take a vehicle with her when she went missing and an extensive search of the area turned up no sign of her. 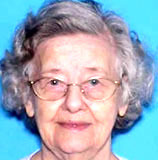 Wilcox's daughter, Jeanne M. Sevigny, reported her mother missing a day after she last saw her. Jeanne said she hadn't done so sooner because she believed Wilcox could have survived outside for a day on her own. Wilcox was living with Jeanne and Jeanne's husband at the time of her disappearance. She had previously lived in an assisted living facility in Williston, Vermont, but was asked to leave after she became suicidal and confused. Jeanne said she believed Wilcox had run away because she found out Jeanne was considering placing her in a nursing home. She stated her mother had said she wanted to return to her home state of Pennsylvania and might have called a taxi to take her there, but there was no evidence to support this. In December 2009, Jeanne was charged with second-degree murder in her mother's case. Authorities believe she shot Wilcox to death, burned the body, and brought what was left in a suitcase to her son, Gregory M. Sevigny, for burial. He and a coworker allegedly buried the suitcase in the woods behind Westford Elementary School. Gregory was charged with unlawful disposal of a body. Photographs of Jeanne and Gregory are posted with this case summary. The case broke after Gregory's ex-girlfriend went to the police and told them his story about getting rid of his grandmother's body. Gregory allegedly told his girlfriend that Mary had made a suicide attempt, but was still alive when Jeanne found her, and Jeanne shot her to death. The girlfriend said she hadn't come forward sooner because Gregory had threatened to kill her if she told anyone. When the police confronted her with the evidence, Jeanne admitted her mother was dead, but stated her death was an accident. She said Wilcox found her pistol and when Jeanne tried to wrestle it away from her, the gun went off, hitting Wilcox in the chest and killing her. She said she panicked afterwards and concealed her mother's death, in part because she didn't want the rest of the family to know Wilcox had taken her own life. Gregory's girlfriend said she doubted Wilcox could have found her daughter's gun and shot herself with it; she stated Wilcox needed assistance with daily activities and was very groggy most of the time. Authorities stated Jeanne's behavior after her mother's death was inconsistent with an accident and that they believe she murdered Wilcox to avoid the burden of caring for her. Her husband was out of state on a trip when Wilcox disappeared and had no idea what had really happened to her until Jeanne was arrested. The charges against Gregory were dropped in September 2010, because the statute of limitations had expired. Jeanne pleaded no contest to voluntary manslaughter and guilty to unlawful disposal of a body. She was sentenced to four to fifteen years in prison. A second-degree murder conviction would have carried a sentence of twenty years to life in prison. Foul play is suspected in Wilcox's case due to the circumstances involved. Investigators are attempting to find her body. Updated 5 times since October 12, 2004. Last updated March 19, 2016; weight added, details of disappearance updated.